The Zika virus outbreak continues to spread throughout the Western Hemisphere and concerns are growing for pregnant women because the mosquito-borne virus has been linked with a serious birth defect called microcephaly, characterized by an abnormally small head and brain in infants. Here are the latest updates about the outbreak, which the World Health Organization has deemed a "global health emergency." The U.S. Olympic Committee will bring in two infectious disease specialists to give advice to athletes ahead of the Olympic games in Rio de Janeiro this summer, according to the Associated Press. In a letter sent to athletes, Scott Blackmum, the CEO of the USOC, said the athletes' well-being was the "highest priority." "I know that the Zika virus outbreak in Brazil is of concern to many of you," Blackmun said, according to the AP. "I want to emphasize that it is to us, as well, and that your well-being in Rio this summer is our highest priority." The disease specialists will be on-site in Brazil to advise athletes about the Zika virus. The announcement comes days after U.S. Women's Soccer star Hope Solo told Sports Illustrated that she had serious concerns about the Zika virus and would not attend the games if they were held today. At a hearing with the U.S. House of Representatives, officials from the U.S. Centers for Disease Control and Prevention (CDC) and the National Institutes of Health (NIH) said they had more evidence that links the Zika virus to a dangerous birth defect called microcephaly. The CDC reported that genetic material of the Zika virus was found in brain tissue from two infants with microcephaly who had died. CDC Director Dr. Tom Frieden said this was "strongest evidence" to date of a connection between the birth defect and the virus, but cautioned it was not yet a definitive link. 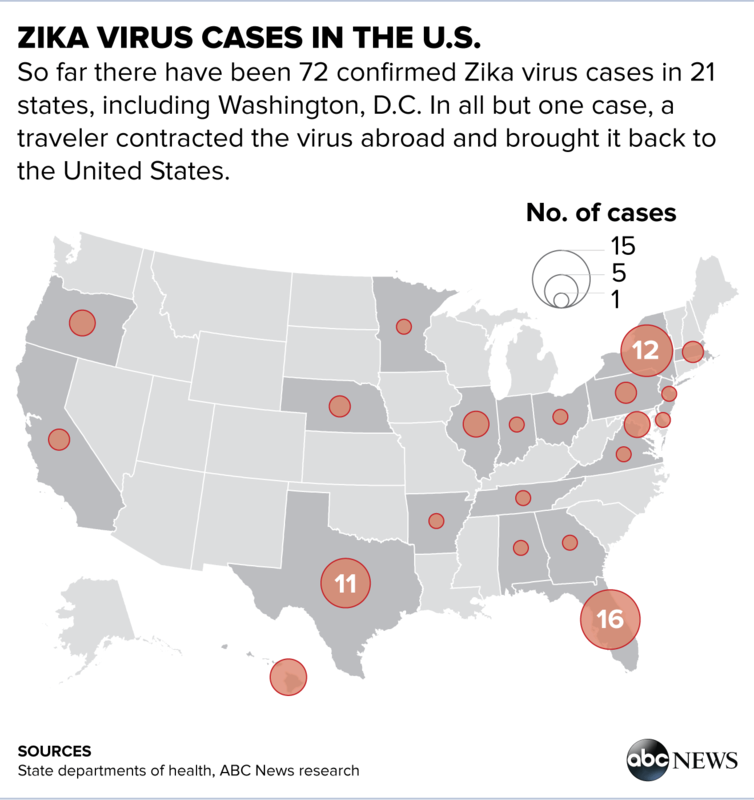 At least 72 People Infected with Zika in the U.S. There are at least 72 people who have been diagnosed with the Zika virus in the U.S. since the latest outbreak began. Those who have been infected are spread across 21 states and Washington D.C. At least four pregnant women have been confirmed to have the virus. All of the infections are believed to have been travel related except for one that was transmitted through sexual contact from an infected traveler to their partner. Common symptoms of the Zika virus include fever, rash, joint pain and conjunctivitis, according to the CDC. Approximately one in five people infected with the virus show symptoms. Severe complications from the virus that require hospitalization are rare, according to the CDC. The virus has also been associated with a rise of microcephaly birth defect cases. The CDC is also investigating if a rare paralysis syndrome called Guillain-Barre is related to the virus. The syndrome is an immunological reaction that can also occur after other viral or bacterial infections. The virus is transmitted mainly through the bite of the Aedes aegypti species of mosquito. This is the same type of mosquito that spreads dengue fever. The Aedes albopictus species has also been identified as a potential carrier. Before the current outbreak, the virus had been found mainly in tropical settings in Africa, Southeast Asia and the Pacific Islands. An outbreak of the disease in Brazil led to an alert by the Pan American Health Organization last May. Health officials have also reported rare cases of transmission through blood transfusions and through sexual contact, including the previous case mentioned in Dallas, Texas.